This extraordinary object looks as if it came from outer space. It's around 11 centimetres long (4.3 inches). It weighs a bit more than 170 grams (six ounces). Its overall colour is a sort of greenish black. But it's entirely composed of darkly reflective crystalline facets, ranging in size from microscopic to about 8mm (5/16ths of an inch) in length. On close inspection, the mass of crystals comes in a dark rainbow of different colours; yellows, blues, purples and reds. Just like solid chromium, this stuff doesn't look real. Like the chromium, it looks more like some sort of movie prop. But my chromium lumps look like rocks spray-painted silver for an Original Series Star Trek episode in which those silver rocks were the most valuable object to appear. This stuff isn't nearly as shiny, but is much flashier, if you get my meaning. It's detailed. It's high-definition. It looks like a prop from a sci-fi movie we won't have the technology to make for another ten years. You know what it looks like? It looks like black kryptonite, that's what it looks like. Or possibly this stuff is what was left over after Gus Gorman boiled some home-made kryptonite in ammonia and ether and then smoked it . This mass of black crystals is actually a chunk of crystalline silicon carbide (SiC), which I purchased quite cheaply on eBay (see below. There's video, too!). This means it must be man-made, because natural, "native", silicon carbide does exist, but it's fantastically rare. It takes a lot of energy to persuade silicon and carbon to form a molecule. Native silicon carbide is known as "moissanite", and so are simulated diamonds made from high-purity SiC. Far, far more SiC is made for use as an industrial abrasive or super-hard coating for tools, though, and some such process probably made this lump of the stuff. 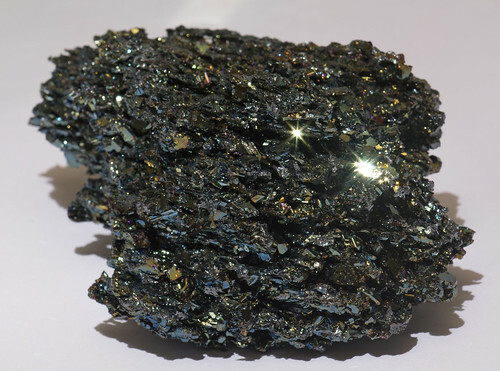 Silicon carbide is so widely used as an abrasive because its Mohs hardness is as high as 9.5, between corundum (sapphire, ruby, and a component of emery) at 9, and diamond at 10. Those numbers are misleading, because the Mohs scale is ordinal; it tells you what's harder than what, but not by how much. There are different ways of measuring the hardness of a material - compare and contrast the Knoop, Vickers and Rockwell tests, for instance. Whatever method you use, if you do a relative-hardness test, pretty much everything looks sick compared with diamond. Assign a relative-hardness score of 10 to diamond and, depending on what test you use, corundum may score as high as 2.63 or as low as 2.2, and silicon carbide may score as high as 4.63 or as low as 2.5. For further comparison, quartz, generally regarded as a pretty hard material, scores down around one, if diamond is 10. I don't know exactly how my lump of SiC was made, but I suspect it was an unwanted byproduct of some industrial process, perhaps one or another kind of vapour deposition. The carbide is meant to coat drills or saws or something, but it deposits elsewhere on the equipment too. When some lucky duck gets to clean out the machinery, stuff like this crystal mass ends up in their bucket. Most industrial waste is not particularly decorative, but every now and then, something extraordinary comes along. I also don't know how pure this carbide is. High-purity silicon carbide can be black, just like this material, but there may be various impurities in there too. The surface is definitely not pure SiC; the rainbow reflections are created by a very thin layer of silicon dioxide on the surface. This interacts with light in the same way as various other super-thin coatings, like the surface of anodised titanium, the "rainbow of temper" on steel, or a soap bubble, for that matter. Silicon carbide is very hard, but rather brittle. If you buy a chunk mail order like I did, you're going to get a few broken-off crumbs in the box along with the main piece, unless the seller packed the carbide in thick cotton wool. And if they did pack it in cotton wool, you're going to spend forever picking cotton shreds off the pointy crystals. Just hitting the thing with a blowtorch might be a faster solution. Or it might heat-shatter. You don't really have to treat SiC like the egg of a tiny bird, though. When I deliberately broke off a little crystal stuck to the main mass by a couple of millimetres of hair-thin filament, I was surprised to see the filament bend a good five degrees before it snapped. And tiny crumbs coming off even a small SiC lump won't make any obvious difference to its appearance. One thing you probably don't need to worry about your silicon carbide doing is melting. The melting point of pure silicon carbide is 2730°C, 3003K, or 4946°F in the old money. So you may be able to melt it with an oxy-acetylene torch; the theoretical perfect-combustion temperature for that is around 3500°C. Oxy-hydrogen might manage it, too. MAPP-gas and oxygen probably won't cut it, though, and no cheap butane torch will come within a hundred miles. Silicon carbide was the material used for the very first light-emitting diode, way back in 1907, though this discovery was largely ignored at the time. That could be why nobody managed to make an LED bright enough to be useful for anything until the Sixties. Henry Round's original discovery was still scientifically important, though, and I swear I managed to get a tiny spot of my chunk of SiC to light up under a pin connected to minus 12 volts. But once I set my camera up, it refused to do it again, no matter what I poked with the pin or where I attached the positive cable's alligator clip. Trying, and failing, to make my own carbide-LED picture was quite frustrating. I can see why people in the early days of radio were so happy when they could buy machine-made vacuum-tube diodes so they didn't have to fool around with super-fine wires and lumps of galena any more, poking around all over the crystal like a tiny pirate seeking one buried treasure chest on the whole island of Barbados. Aaaaanyway, you may be pleased to know that I am now finally going to tell you where I got this stuff, and what it costs. I bought a little chunk of crystalline silicon carbide on eBay a few years ago, from this seller, but they don't have any SiC for sale at the moment. This new bigger chunk was another eBay purchase, for $US28.17 including delivery to me here in Australia, from this seller (who's here on eBay Australia, here on eBay Canada, and here on eBay UK). As I write this, they've got one more lump of the stuff, closer to spherical than mine and weighing 210 grams. The inimitable Theodore Gray has a chunk of this stuff too; he bought it on eBay as well, but from a seller who called it "native bismuth". Dark SiC crystals resemble bismuth hopper crystals (see here) in colour, but that's as far as the resemblance goes. Nobody on eBay seems to be selling silicon-carbide "bismuth" at the moment; there's plenty of "native bismuth" crystals that're obviously actually purified bismuth crystallised by the standard stovetop method, but at least those actually are bismuth, so by eBay fake-minerals standards no great crime is being committed. Behold, the silicon carbide lump, and the chromium, and a couple of large oval-cut cubic zirconias ("CZs") into the bargain. They all look impressive in sunlight. The smaller CZ is, at about 36 by 29 by 22 millimetres (1.4 by 1.1 by 0.9 inches), comfortably in the Crown Jewels size range. If it were a diamond, it'd be around 155 carats (as a CZ, it's 255 carats - CZ is about 1.6 to 1.7 times as dense as diamond). This is a bit less than the original cut of the Koh-i-Noor, but about 1.5 times the Koh-i-Noor's current size. The larger CZ is about 52 by 38 by 28 millimetres (2 by 1.5 by 1.1 inches), and weighs 132.5 grams; a diamond the same size would be about 400 carats, far larger than any of the world's famous colourless diamonds, and a little less than the total weight of all of the multicoloured diamonds in the two "Aurora" displays. I bought both CZs in 2009 from this eBay seller; the smaller one cost me $US19.95 delivered, and the bigger one was $US37.95. That seller doesn't seem to have a lot of huge CZs on offer today, but if you use the always-entertaining "highest price first" sorting option but set a price ceiling at, say, $100, then in among the eBay listings for bags containing many small CZs, there are plenty of monster white and coloured stones. I had no idea that CS was that cheap! Sorry Dan, but the most interesting thing was the link to using a microwave an an induction heater. The plasma from grapes thing is pretty neat too. Now I kind of want to hook up three or so magnetrons (because obviously more is better) and melt some metal. Would the magnetrons interact with each other in some weird potentially life ending pyrotechnical display or be fine do you think? Obviously a Faraday cage of some sort would be needed to preserve sperm count. Huh. Tried the grape thing but apparently it's much harder to pull off then it looks. I did get some pretty good sparks, but that's about it. I'm confused, you mean to say that the magnetrons interacting in some wierd potentially life ending pyrotechnical display is NOT fine? Well, not when I'm the one standing next to them eagerly waiting from some molten metal to play with, no. From far away, perfectly fine, yes.